A new approach to new office environments: the free-to-move concept places stimulation and a natural range of motion at centre stage of new sitting ergonomics. Wilkhahn developed the free-to-move concept in order to combat the increasingly physically inactive style of working in digitalised office environments. A five-part series here on the blog will outline the most important background information, issues and solutions to serve as inspiration in designing workspaces that encourage more agile bodies and minds. In the second part you can find out how stimulation and a natural range of motion are the focus of new sitting ergonomics and how the free-to-move concept helps to put this into practice. Just under 40 years ago, Wilkhahn cultivated dynamic sitting with its legendary FS-Line office chair range, which is still popular today. For many years now, ergonomists have agreed that the best posture to adopt while sitting is always the next one. At the same time, the idea of a correct posture is still advocated and encountered in many office chair classifications. On a “the-more-the-better” basis, companies market lots of settings to fine-tune chairs to our bodies and ensure as little physical activity as possible, which is a contradiction in itself: because a corset doesn’t provide any stimulation and makes muscles weaker. And any effort required to change posture is thwarted. Which is why healthcare researchers focus on stimuli and a natural range of motion as part of new sitting ergonomics. Any pain-free posture that the body can adopt, any movement it can make is considered important and right as long as it’s not permanent: from sitting up straight to lounging about. The rule of thumb is the more frequent the changes of posture and more varied and natural the movements, the better the stimulation of the metabolism, physical skills and mental faculties. In the first part of the free-to-move series you can read about the background to and causes of today’s lack of physical inactivity. 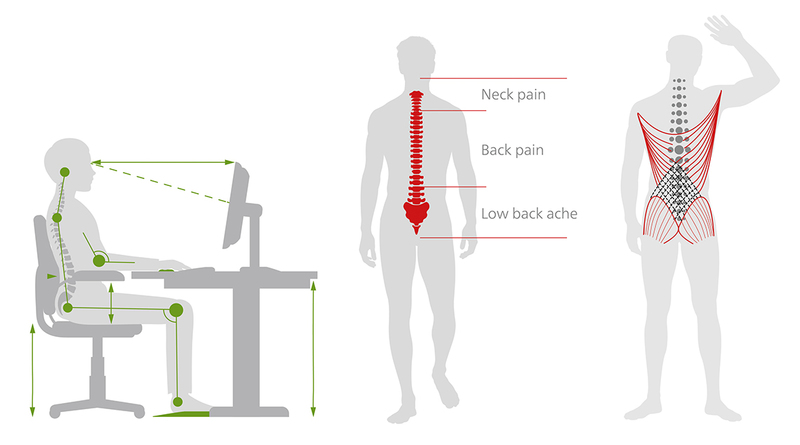 What conclusions can be drawn for new sitting ergonomics? In part 3, you can find out how Wilkhahn uses its patented Trimension® technology to teach sitting to walk. In part 4, we’ll be presenting three studies by the Center for Health (ZfG) that scientifically underpin the benefits of the free-to-move concept. Part 5 will provide an overview of Wilkhahn’s three office chair ranges in which the concept’s used.